People are visual beings that frequently prefer seeing images rather than merely reading words. We can take in far more information in less time by looking at an image or photo than reading a line of text. Visual images can include photos, images, illustrations, graphics, videos, and more. But, having an in-house repository of original images readily available at your fingertips often isn’t possible for many businesses. This is where exploring some of the world’s best stock image websites for royalty free stock images can be beneficial. 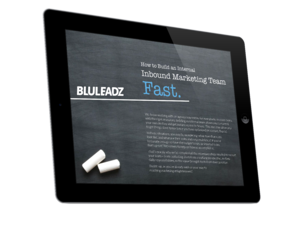 With regard to marketing — particularly inbound marketing — we can use this to our advantage. According to the 2018 Social Media Marketing Industry Report from Social Media Examiner, 32% of marketers said that visual images were the most critical form of content for their business, followed by blogging (27%). As such, it’s important for marketers to either have original images available or to purchase stock photos from some of the best stock image websites. Visual content is more engaging. Content that contains visuals gets 94% more total views. It’s what your brain receives. 90% of information that is sent to the brain is visual. It’s faster to process. Visual content is processed 600,000 times faster than straight text. It’s how we learn. 65% of people self-identify as visual learners. It is for these reasons (and more) that, without further ado, we present our list of the top 17 websites where you can find engaging stock images and stock photos. This massive image resource — which was the first stock images website in the business of licensing images online back in 1995 — serves organizations in more than 100 countries worldwide. Today, it is one of the best stock image websites in the world with a library consisting of millions of stock photos, illustrations, images, and videos. It’s an easy website to navigate, and you can easily find images that you can purchase individually. Much like its big brother, iStock is one of the best stock photography websites because it offers millions of affordable, high-quality, and royalty-free stock photos. In addition to featuring user-friendly functionality with search and browse features, you also can enjoy purchasing credits in pre-packaged units and using those credits to pay for your images. The cherry on top is that they also have free stock files weekly for users who join their stock images website! Adobe Stock is a service that is included for Adobe’s Creative Cloud subscribers and complements Creative Suite by being compatible with its design tools. You'll find more than 50 million royalty-free photos, videos, templates, 3D content, illustrations, and vector graphics on this stock images website. Because of its compatibility with Creative Suite, users can purchase images directly in Photoshop, InDesign, Premiere Pro, and Illustrator. PixaBay has some of the best stock photos and visual content – 1.5 million files, in fact – that are royalty free stock images, vector graphics, illustrations, and videos. Another of the royalty-free stock image websites comes in the form of NegativeSpace. This digital library of images contains high-resolution stock photos that can be used without restrictions. All of the stock images are shot by photographers within the NegativeSpace community. Want to receive free stock photos in your inbox? You can sign up for their delivery service for free simply by providing your email address. 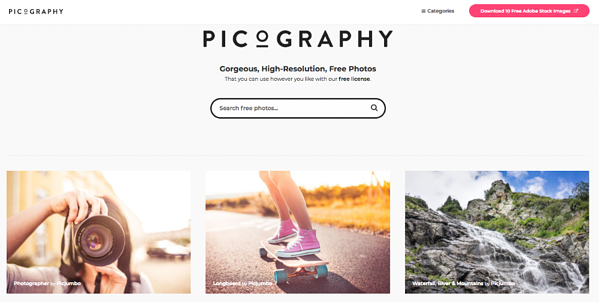 No matter whether you’re on the hunt for photos for both commercial or non-commercial use, Picjumbo is a great resource to find 100% free stock photography. They are adding new photos daily and have a bunch of photo categories to choose from. 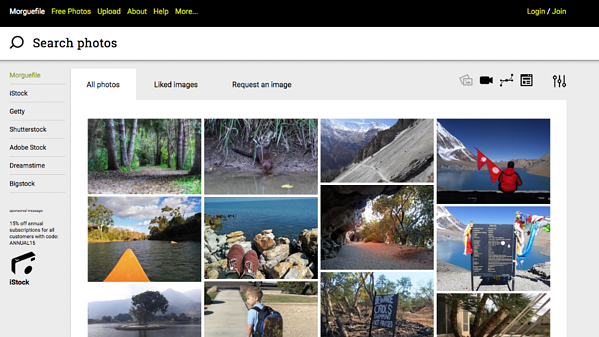 Users have access to more than 100 photo collections. And, much like NegativeSpace, you can sign up with your email address to receive free stock photos in your inbox that you can use as well. However, if you want access to their premium line of images, they offer a paid member service as well. Burst is a free stock photos website that has an image library of thousands of high-resolution, royalty-free images. The images can be used for virtually anything for commercial use with no attribution required. This means that if you’re looking for some great free images for your blog, website, or social media accounts, you can check out this resource and find some free goodies. Adding to the list of websites that offer royalty free stock images for free is Unsplash. This digital library of high-res photos boasts more than 550,000 images that are up for grabs for personal and commercial purposes. While their license allows the use of their photographs without copyright limitations, they do request that you use photo credits whenever possible to give attribution for the image. 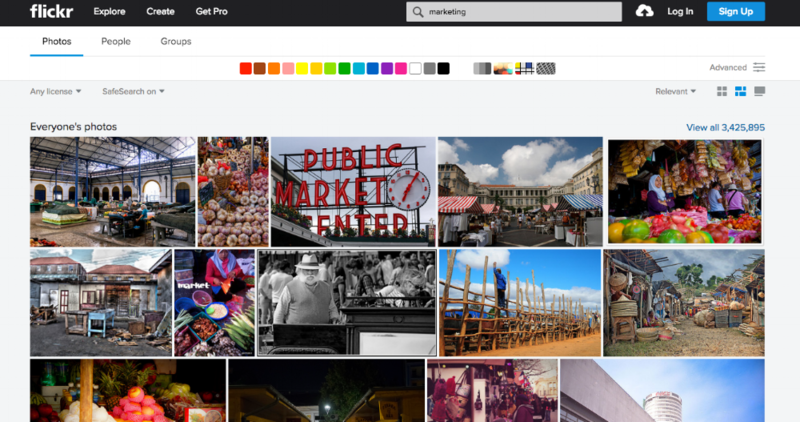 Home to tens of billions of photos and two million groups, suffice to say, Flickr is the largest online photo management and sharing platform the world has ever seen. While not all images can be used for commercial purposes, some photographers will allow you to do so. Surely, with such a large community, you’ll be able to find stock images that will meet your needs on what has become one of the best stock photography websites. Offering more than one hundred millions royalty free stock photos, illustrations, vectors, and video clips that are created by artists, designers, and a select list of well-known agencies, Fotolia is a crowdsourcing librarian’s dream. In addition to having no time limits or restrictions on printed copies, all of the content is royalty free. This makes this one of the most beneficial stock image websites. And, as a bonus, when you sign up for Fotolia/Adobe Stock, you can receive 10 free Adobe Stock images. Looking for access to illustrations and stock photos that are licensed for commercial use without the need for attribution? Look no further than Freerange Stock. All materials (defined as animations, images, files, photographs, meta data, or text) that you download from the site are licensed to you. These stock images and other visual files can be used without attribution for commercial or non-commercial purposes. Shutterstock is a beast of a resource for royalty-free stock images for both personal and commercial use. The stock images website, which has more than 235 million stock photos, stock video clips, and music tracks available, offers both prepaid image plans and value-priced annual plans for individual use, as well as team and enterprise plans, that can meet your budgetary needs. 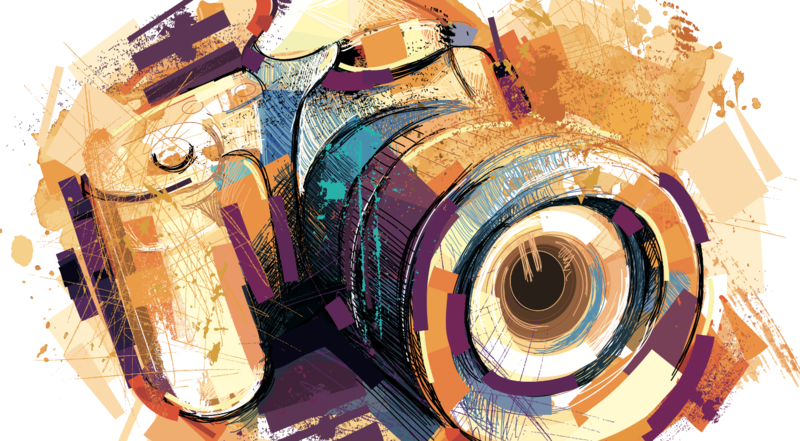 If you’re looking for videos, stock photos, and vectors, Bigstock is a great resource. As another of the big stock image websites – with more than 71 million pieces of digital content to choose from – you surely won’t be disappointed. StockSnap offers free stock images for commercial use, personal use – virtually any use – with no attribution required. You can use the site’s search feature or browse images by category. And, with hundreds of images added daily, and thousands of stock images in the site’s library, you can enjoy great images without a bunch of strings attached. In a nutshell, it’s an online community that permits you to search and use images by others. You also can edit the files before downloading them. However, that ability does require a pro account for that access. With more than 100,000 stock photos and images to choose from, RGBStock.com is one of those stock image websites for finding images for your site in a pinch. 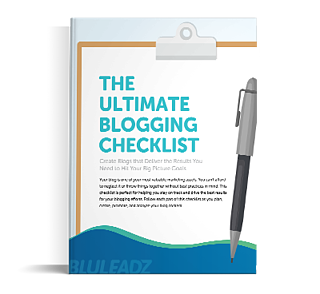 It is a particularly great source for businesses that lack big budgets. Seeking to use some vivid, high-resolution stock images and stock photos without the hassle of attribution? You can with Picography. Much like several of these websites, you can use these images for commercial or non-commercial purposes. 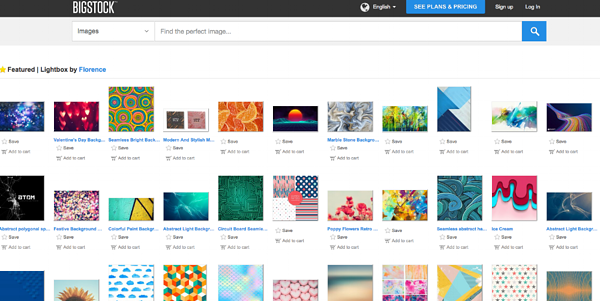 And, when you register for the site, you can download 10 free Adobe Stock images. We hope this list of the best paid stock photo sites and free stock image websites helps you meet some of your organization’s needs. You have a wide array of images from which to choose – more photos, vectors, videos, and other files than you can shake a stick at. Be sure to check out these stock image websites for inspiration and to help save your budget. Editor's Note: This post was originally published in March 2018. It was updated in October 2018 for accuracy and comprehensiveness.